"F4 this weekend. 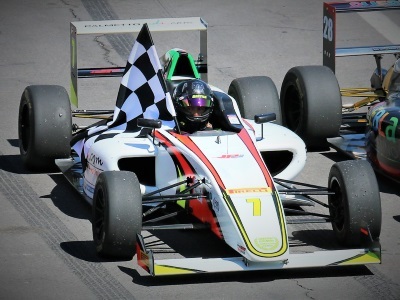 Legend Car next weekend"
Puebla, Mexico (February 5, 2019) – Back to Mexico for the next event weekend in the NACAM Formula 4 Championship, Texan Jak Crawford had another stellar weekend in open wheel competition. Successful in karting, Legend Cars and Formula 4 competition in the past three months, Crawford claimed three more podium results, including one victory this past weekend and was the only driver to stand on the podium in all three weekend races with fastest lap time in each race as well. Saturday proved to be a very difficult day for the young talent as two, one-hour practice sessions were hampered by engine issues. Pacing the first forty minutes of the practice one with the quickest lap times, Crawford was forced to sit out the remainder of session one, all of session two and the one and only qualifying session on the weekend – a huge adversity for Crawford in only his second time in an F4 race weekend. As the field cycled by, Crawford was released from the pits and began his march towards the front of the field. Catching one driver on the opening lap, Jak damaged his front wing while attempting to make his first pass of the event. Then, methodically making his way through the field, Crawford arrived at the rear wing of the second place driver, but was unable to take the position before the checkered flag flew. Sunday saw one warm-up and two wheel-to-wheel races as Crawford eventually found his way to the front of the field. Once again pacing the practice session in the morning, the American driver started race two from the third position, and took the point by the end of the opening circuit. Handling three caution flags like a seasoned veteran, Crawford went on to crush the field and top the podium blocks. The third and final race of the weekend saw the race two winner line up inside row five in the tenth position. 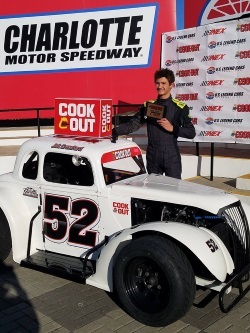 Passing four competitors on the opening lap, Crawford was able to catch the second and third place drivers while the leader stretched the gap to an eight second lead, and further extend that to eleven seconds before Crawford was able to get into the second position. With another caution free race, Jak closed the gap to the veteran British F4 driver to almost two second before time ran out. With just a few days off, the multi-discipline driver will return to the Legend Car scene as he travels to Florida next weekend. Rejoining Mark Nahrstedt Race Cars, Crawford will look to claim the Pro Championship at the prestigious week long Winter Nationals event in Inverness, Florida. Last year Jak won four out of five races and a championship two divisions lower than the Pro division in which he races this year. Jak Crawford would like to thank all of his partners and supporters for a great start to the 2019 season. David Martinez and Team Martiga field the best cars in Mexico and their mechanics worked tirelessly all day Saturday to fix Jak’s car just in time for race one. Darren Manning and iAdvance Motorsports have been an integral part to Jak’s development and a big thank you to them for their help and support. A huge thanks to OMP Racing Gear and Bell Helmets for their safety products and long time continued support. For more information on Jak Crawford please follow him on Facebook: @jetpakjakcrawford and on Instagram: jakcrawford52. Jak’s marketing website is jetpakjak.com.